Thank you Jay-me for liking a post of mine. I am not a very graphic person but I enjoyed following links from your blog to Jonathan Feinberg’s Wordle which was so easy to use and such fun! I couldn’t resist having another go…. For Mac Users: To take a partial screen grab with a Mac: press Command (Apple key on old keyboard) and shift together and hold them down. Then press 4. You will see a cross hair (like a gun sight) appear. You can let go of the keys now. You can then click and drag your mouse to make a rectangular shape over the area you want to grab. Once you release the mouse it will make a click sound like a camera (well it used to!) and should put a .png file of your screen shot on the desktop of your Mac. Edit : For Windows users : To take screen grabs if you are unfamiliar with this procedure. Go to this site and they show you very clearly how to do it. There’s even a little video on there showing you how to do it in Windows. 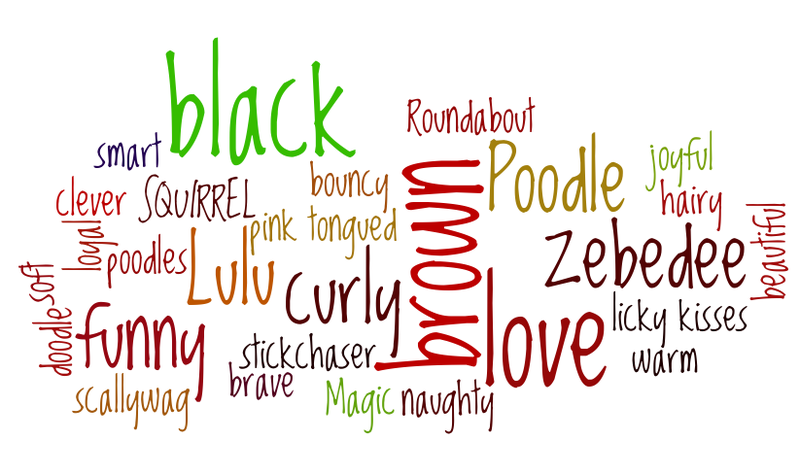 If this is all a ‘bit much’, but you would like to have your Wordle on your computer (as I started this!) save the image to the Public Gallery on the Wordle site. Copy the link and let me know, by posting the link in your comment, and I will go and take a screen grab and email it to you and then it will be yours! I don’t promise to do it instantly but I’ll do my best. OK I can either start again and write another post or just add on here so I’ll try that first….I’ve added some screen grabs below to try and illustrate the process. I’m not a pro at computer talk or step by steps so I hope this makes it a bit clearer. I’ve emailed the creator of the programme to make sure that he is Ok with me doing this…I just heard back from Mr Feinberg and he says it’s fine! Isn’t that nice? I’m so scatty brained and I should have thought before I posted this Word Play post. My apologies to my lovely friends who always try and play along with my whims. I’ve had another look at the site this morning and here are some instructions on how to use and save the Wordles to your blog. Providing you know how to cut and paste you should be allright. 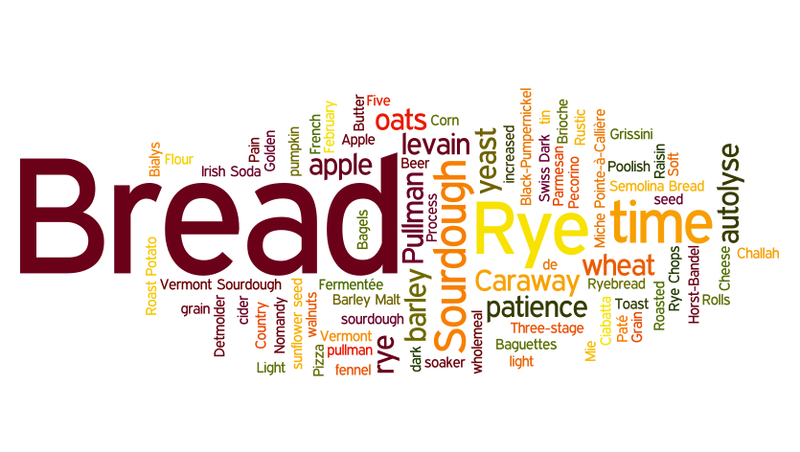 Zeb~Bakes Zeb~Bakes bread bread oats barley wheat rye milk sourdough sourdough. a window like the one below will open asking you to input a title and so on, you can put anything you want or leave it anonymous. Just remember not to put your pin numbers and phone numbers and identifying data in there of course. You don’t need to name it or put your name on it, but once you have done it, click OK. Then the programme will generate some code below the window. 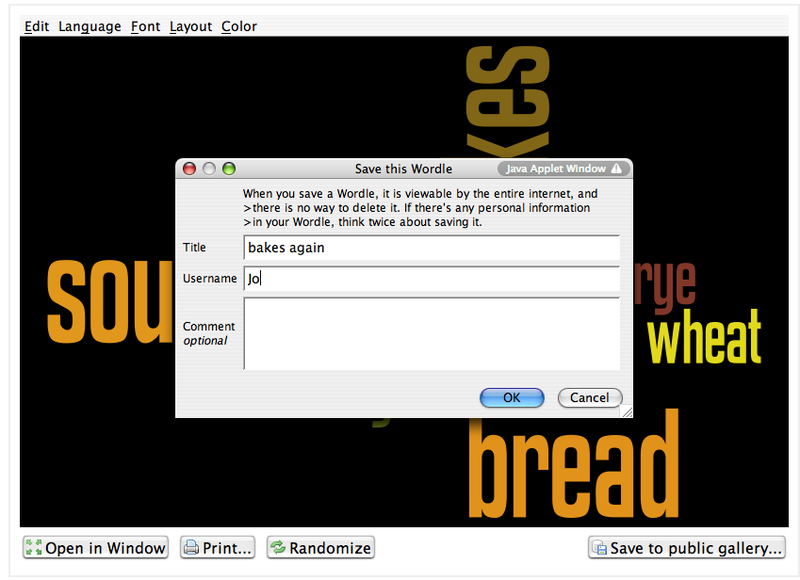 Here is an example of what the code looks like and where to find it on the wordle site once you have saved your image there. If you are using a WordPress blog switch to the html view in your edit window and paste the code in and the magic of WordPress will make it appear as an image that links back to the Wordle site. I don’t know what happens in Blogger I’m afraid. Why not try copying and pasting the code below into a trial post and see if you can make it work? I have posted this one below in my reply to Debra as an example of how it comes out. If you click on the little image it will take you to the bigger image in the Gallery. You can also save the image as an image using a screen grab as I described above and not save it at all in the Gallery on the public site. This entry was posted in Blogging, Pure Joy and tagged baking, Bread, Jay-me. 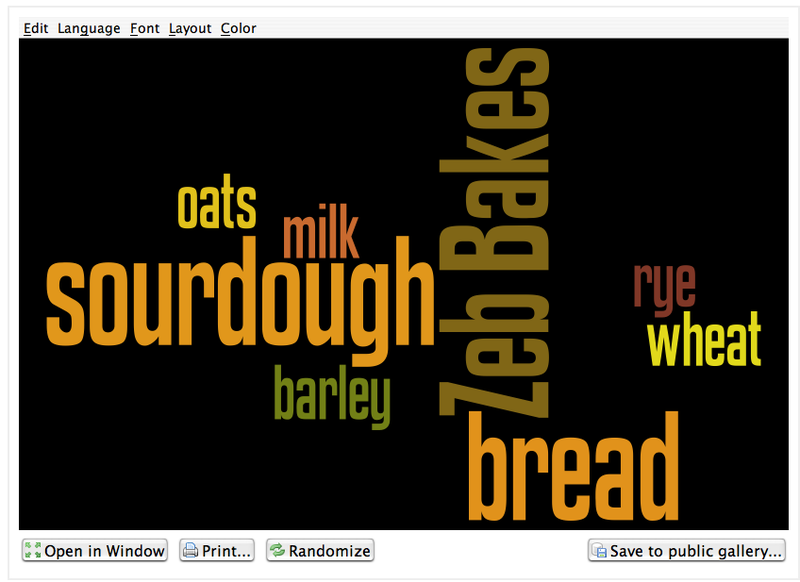 bread, Jonathan Feinberg, pictures, Wordle, words on 22/02/2011 by Joanna. Is is easy for computer cretins? Yes! You can do it! And I know you are not a cc ;) I am trying to restrain myself from wordling everywhere, like an incontinent puppy…. I am actually fairly useless with a computer. I have taught myself to do basic stuff on the blog, but apart from that I have to ask for help with very ordinary things. Hey don’t worry about it! It was just for fun. I can try and do a step by step on how to create and save a Wordle if you like but it might look a bit different if you have a PC from a Mac. Don’t want to cause stress here ;) I’ve just found the easy way to save them. Look! You make the wordle, save it to the public gallery and then they generate code below which you copy cut and paste like here. Eureka! That is such a good image for you, Joanna! I don’t think I could pull it off. Honestly, I can only follow prompts meant for children. I went and tried it. It was neat, but I couldn’t figure out how to save or grab it. :)= thanks! I really am a remedial computer user. Generally I call my son to help- but he’s busy with work and school and has NO time to help. Thanks! I put it up on my blog, today! You are a total sweet heart! I got a good selection of words for a Wordle cloud just by putting my blog address into the relevant section, rather than typing a lot of words, but I can’t figure out how to save a picture for my own use! I see that you have resolved this for yourself. Well done! Edited to add bigdog’s pic as a piccy…. Humm … more tech toys – I’ve got the feeling that this one will require me to reconstruct still more brain cells, and now-a-days, that hurts my head. But, I do want to congratulate you on your ‘bronze’ medal – Good show. I used to enter my breads and jams into our annual County Fair, until I realized that unless I was willing to join the Fair volunteers group, and the old ladies association, and begin going to church too, I’d never win anything there – so now I’m my only judge, which I tell myself is no more subjective than allowing the old ladies of the Fair to judge them. It’s not a bronze as in third place bronze, more a grade, they mark your jar out of 20 points and I got 16 points. I’m not big on competitions either, but was glad I didn’t disgrace myself! There were over 1000 entries, and ironically I thought I would be fairly anonymous, living hundreds of miles away – only to get a note from my Dad saying an acquaintance of his had unpacked my jar at Dalemain and had emailed him to tell him! Sounds fun – will have a go and shout if I get stuck. You’re welcome :D Thanks for the ‘sneak preview’ too, looks lovely Celia! Thanks for that Joanna – I spent rather more time than I should have done messing around with that. I’ve done one now but couldn’t work out how to do a screen shot from my mac – I don’t have an apple. Sorry Choclette, apple key = the command key – it has two symbols on it an appple and a square with four little loops in the corner….no apple symbol on yours ? the one immediately adjacent to the space bar. Or you can use Grab if you have that application on your Mac. 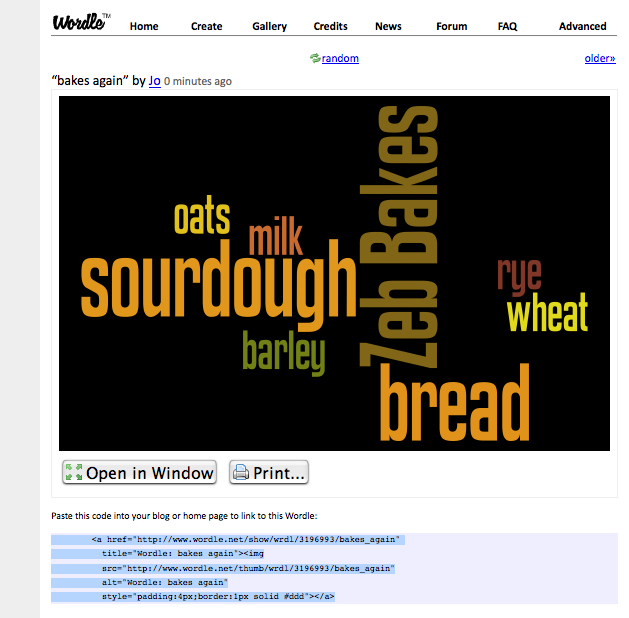 If you saved it to the gallery on the Wordle site I can take a screen shot for you and email it to you. I think I must be more of a geek than I realise…. To take a partial screen grab with a Mac: press Command and shift together and hold them down. Then press 4. You will see a cross hair (like a gun sight) appear. You can let go of the keys then. You can then click and drag this as a rectangular shape over the area you want to grab. Once you release the mouse it will make a click sound like a camera (well it used to!) and should put a .png file of your screen shot on the desktop of your Mac. You’re very welcome, I like your whole blog actually. :-) I’ve just spent far too long on that site playing! Saved it ok, but couldn’t work out how to put it in the comments. It’s funny seeing my blog in summary. If you kept a link to where you saved it, then I can add it, I don’t think you can add images direct to a comment on another blog. I haven’t tried cutting and pasting the code into a comment elsewhere. I imagine that would be up to the blog ‘owner’ to do – on the odd occasion I have added images to comments that people have made I’ve always had to tweak the comment to make it work. Glad you liked it Brydie! Oh, now this looks like fun! Fascinating to see what words come up most! I think Apple have dropped the Apple from at least some of their keyboards! It’s just cmd and a propellor sort of symbol on my latest keyboard. Excellent! I can see I’m going to waste a lot of time with this, thanks Joanna! I just followed Sue’s instructions to screen grab and save in paint then crop, but must try the ‘proper’ way with code etc. Thanks for all your help on this Joanna. I’ve finally done a wee post about it. You’re welcome Choclette! I keep wanting to misquote Shakespeare “…who would wordles bear?” And another five minutes is lost forever while I pause and input a little Hamlet….